Thus far we've explored the ways in which technological progress affects employment, as well as the negative consequences of an unprepared workforce to our economy. Now it is time to examine in detail the specific core skills necessary for most of today's workers, and to identify the ones that schools should embrace as part of the curriculum. A logical starting point for our journey is the Business Roundtable (http://www.brtable.org), an organization of senior business executives devoted to improving education. The organization began focusing on education in 1989, as a result of a presidential challenge from George H. Bush to business leaders to help improve U.S. schools. Business leaders were quick to respond, because even over a decade ago it had become apparent that while the percentage of high-skill jobs was rising, the number of highly skilled job applicants was not. As a result, the Business Roundtable started working to increase expectations for all students and helped shift the debate from “inputs,” such as seat time and cost per pupil, to “outputs,” such as how well students have mastered subjects. While the energy and devotion of the Business Roundtable to education is laudable, the group erroneously assumed that the existing curriculum and testing process is appropriate for today's world, and devoted its efforts to improving student performance within the existing system—instead of enticing people out of Plato's cave for a dose of reality. In order to ascertain what skills should be taught in school, we need to begin by examing the world outside the cave. Once we identify the skills students will need to thrive in the workplace of today and tomorrow, we can move on to explore how to modify the curriculum and measure student mastery. To assume that the existing curriculum is fine as it is reminds me of an old definition of insanity: if insanity means doing the same thing over and over again and expecting different results, then it is sheer lunacy to assume that the existing curriculum is fine as it is. In the past, identifying the skills needed for the workplace was hard work; when asked to name a few of them, senior executives would speak in terms so broad as to be virtually meaningless. Fortunately, the Internet has made our task much easier. An associate of mine, Bob Kenyon, pointed out to me that there are many Web sites available for those seeking employment. Sites such as Monster.com andFlipDog.com contain thousands of job descriptions from companies all over the country, and most of them list the skills required. Research on fundamental skills that used to take months can now be done in hours; and because job listings change daily, skill lists can be updated on a regular basis. Job descriptions can even be isolated by locale, so that regional needs can be quickly identified. Most importantly, because the skills are identified in connection with actual job openings, there is no question about their validity; if a skill is listed, it is required, period. Using Web-based resources, I examined 500 job descriptions, posted in the Spring and Summer of 2001, that mentioned specific skills. I restricted my study to full-time, non-apprentice positions from a wide range of industries—including restaurant and hotel management, heavy equipment manufacturing, retail, and pharmaceutical companies—in a variety of locales, and constructed a table of the six most wanted workforce skills. Before exploring this table in depth, let's be clear on one point: the list is not based on opinion, hunches, forecasts, or guesses, but on research that you yourself are invited to replicate using the Web. Although your percentages may differ by a few points, I am confident that the net results will be the same. Though we may disagree on how best to ensure that students learn these skills, there is no point in arguing whether they are in fact required—they are. Technological fluency is required in over 80 percent of the jobs I looked at; the skill was a virtual given for most of the position descriptions I studied, and I didn't focus on high-tech jobs. Simply stated, technological fluency is the capacity to use computers and the Internet as naturally as you would books, pens, or paper. Three-quarters of the jobs I studied counted communications skills as a prerequisite. This skill transcends the capacity to write and speak well: many of the job descriptions mentioned proficiency with computer-supported presentation tools (such as PowerPoint) as a necessary qualification. You can have the best ideas in the world, but unless you can express them concisely and clearly they will never be implemented. Teamwork was mentioned explicitly in 36 percent of the job descriptions, but was implied in many more. With very few exceptions, the lone-wolf worker is an anomaly these days; collaboration—along with leadership, the fourth most wanted skill—is required at virtually every level of a modern company. The remaining two high-scoring skills, problem solving and creativity, were also implied in many more advertisements than the raw numbers indicate. Numerous job descriptions described successful applicants as ones with a high tolerance for ambiguity, who could solve problems, think “outside the box,” demonstrate strong analytical skills, and learn new procedures, tools, and ideas quickly. In addition to the skills I found and those listed by enGauge, such characteristics as appreciation and understanding of cultural diversity, pride and excellence, and something called “high tech, high touch” were recurring themes in the Web-based job descriptions I studied. It is embracing technology that preserves our humanness and rejecting technology that intrudes upon it. It is recognizing that technology is an integral part of the evolution of culture, the creative product of our imaginations, our dreams and aspirations—and that the desire to create new technologies is fundamentally instinctive. But it is also recognizing that art, story, play, religion, nature, and time are equal partners in the evolution of technology because they nourish the soul and fulfill its yearnings. It is expressing what it means to be human and employing technology fruitfully in that expression. In today's hurried workplace, workers often become so caught up in tasks that they lose sight of the big picture. This hurts their capacity to perform effectively at work, as well as hurting them personally; stress often builds up to the point where personal relationships and health suffer. The problem-solving and creativity skills increasingly required by today's employers take a severe hit when workers lose sight of a balanced life. Technologies designed to liberate people from mundane tasks and to provide improved customer service often have the exact opposite effect when blindly applied. When companies feel pressured to improve productivity, they sometimes reduce the number of people assigned to a task, assuming that improved information technology can allow the same work to be done by fewer people. The consequences of trading people for technology are immediately apparent to anyone who has called an 800 help line for a major institution. Instead of talking with a human being, the caller is usually guided through a maze of prerecorded messages. Unfortunately, the customer whose need is most urgent rarely has an appropriate option from which to choose, and is therefore relegated to the netherworld of “hold hell” until a fellow human being can take the call. When a real-life person finally does get on the phone, the company representative must inevitably deal with the caller's wrath over time wasted on hold in the name of improved efficiency.When we allow our technologies to be used in ways that diminish the human spirit, we do our society a disservice. The world of high tech can be wonderful, but it can also enslave us. For this reason, it is essential that those who work in the pressure cooker of today's workplace find a balance between high-tech skills and the “high touch” skills of life. People whose lives are their work rarely make good workers. They may clock extraordinary hours, but their health, creativity, and problem-solving and communication skills suffer. It is therefore as important as ever for people to find activities outside the workplace that nourish the human spirit—activities that stretch the mind, body, and creativity, drawing us into a place where we are free to experience and learn from childlike wonder. Those who argue that their time is too precious to spend writing poetry or kneading bread dough by hand miss the point. First, our health depends on far more than earning a living. Second, many business leaders have strong interests outside of work—interests that keep their creative juices alive and make them more effective at work. Hewlett-Packard hired medieval historian Carly Fiorina to turn the company around, Compaq entrusted its future to rock guitarist Mike Capellas, and Classroom Connect was cofounded by R&B piano player Rem Jackson. This list could extend longer than a trip on one of Malcolm Forbes' motorcycles, because people with a balanced life are more effective workers than those who focus exclusively on their jobs. In my own case, as an emerging-technologies futurist, I feel most fulfilled exploring the countryside with my wife or playing the blues on guitar. In fact, if I had to choose between computers or guitars, I'd give up my computers in a heartbeat. The fact is that my guitar playing has made me a better presenter by providing me with insights on topics related to work. My wife, Norma, is also an emerging-technologies futurist. One of her creative outlets is sewing and embroidery, and there is no question that the problem-solving skills she develops with her craft help her with work as well. Such real-world evidence of the influence of “high touch” skills should be of great comfort to educators who fear the loss of their arts programs in the face of a return to “basics” (as if there were something more basic than art!). But we must still pay very close attention to the foundational skills identified by the Glenn commission and others. The existing curriculum fills the day to overflowing, and if new skills are being added to a full plate, something needs to first be removed to make room. Fortunately, I think there is a litmus test that can help determine whether a particular skill should be taught in school or acquired elsewhere, such as through on-the-job training. We need to start by drawing a distinction between two kinds of skills: those with a short shelf life, and those that will remain relevant for a long time. Skills relating to specific operating systems or to specific software titles are “short-life” skills, because they cease to be relevant as soon as a new version of software replaces the old one. The heated debate a few years ago as to whether schools should continue to use the Macintosh operating system when they were going to graduate into a “Windows world” missed the point. Operating systems are “short-life” programs, whereas the proper focus for education should be on long-life skills. While schools still have to decide on a platform to use in class, this decision must be based on factors other than which system is most popular among corporations at a given time. The key is to define the kinds of tasks that students will be responsible for, and to choose the software and operating system that best perform these tasks. For some tasks, Windows is the clear choice, for others it's Macintosh, and for still others it could be Linux or some other flavor of UNIX. If the choice of operating system is not central to my definition of technological fluency, then what about specific software titles? For example, shouldn't every student become conversant in PowerPoint? Not necessarily: PowerPoint is only one of several programs that can be used to create presentations. Other programs are less expensive and even better, if not as popular. Furthermore, PowerPoint will, hopefully, evolve over time, and the version that students learn today might be far different from the version they encounter when entering the workforce. The same argument applies to the choice of word processors, databases, spreadsheets, web browsers, and all the other tools that are used in classrooms. All of these specific tools will have migrated to new versions with new features and new command structures by the time students enter the workforce. So, if all computers programs are short-life tools, what is left for schools to offer students? The answer is simply this: we teach children to use whatever software we happen to have available at a given time, but with a focus on the bigger picture, rather than on the minutia of mastering some obscure feature exclusive to that particular program. In other words, when we teach students to use word processors, our focus should be on the writing process and on presentation—issues of font selection, margin size, and the use of headings, for example. Although students will learn how to do these tasks using a set of commands specific to the word processing program used, they will know that the skills themselves will apply to any system they may confront in the future. There are two main reasons why this list is a starting point in our quest for technological fluency. First, students will likely use the skills needed to master these tools for the duration of their eventual careers. And second, these tools can be used effectively to explore other academic topics, making them essential not only for students, but for teachers as well. If you will accept for the moment my list of tools that students should learn, let's turn our attention to the concept of “fluency.” Fluency transcends merely knowing how to do something; it means doing things almost automatically, without being conscious of every little step, like driving a car or riding a bicycle. Want to create a document? Just boot up the word processor and start typing. This level of comfort with software is exactly what employers are looking for. They expect their employees to know which tools are best for which tasks, how to use them effectively, and how to deal with new versions of software on their own. The goal, after all, is the project, not the tools. The only way I know to achieve fluency in any field is to use the tools so much that they become second nature. In order to do so, the tools must be available at anytime, wherever they are needed; if students have to trek to the lab just to use a word processor, it is hard to imagine them ever becoming fluent in its use. Some may argue that schools don't need to focus on technological fluency when most students have Internet access at home, because the students will simply pick up the necessary skills on their own. While it may well be that home-based computers help familiarize students with the use of hardware, there is no guarantee that students can develop effective strategies for analytical work when left to their own devices. There is a world of difference between knowing how to send e-mail and knowing how to compose a message that effectively conveys your ideas, and a teenager is not likely to pick up this latter skill during late-night sojourns online. Statistics on student use of the Internet speak volumes to the challenge we face. According to Teenage Life Online (2001), a report for the Pew Internet and American Life Project (www.pewinternet.org), 73 percent of U.S. youth between the ages of 12 and 17 use the Internet. While 94 percent of these teens report using the Web for research on school projects, and 71 percent report that the Internet was a major source of information for their most recent school project, only 5 percent said that they learned how to use the Internet in school; 40 percent were self-taught, and the remainder learned from parents, friends, or siblings. Before we celebrating this as evidence of self-directed learning, keep in mind that comfort with the Internet does not necessarily imply knowing how to use the tool effectively. As the Pew study documents, teens rely on “gut sense” or “I know it when I see it” rules to determine the accuracy of online information. Clearly, they need help learning how to evaluate information properly; unfortunately, even though almost all schools in the United States are now wired to the Internet, we have failed to mandate the instruction of foundational information literacy skills to students at an early age. Unfortunately, very few educators have received instruction in these skills themselves. Furthermore, most educators were taught by college professors, a group that is not generally well versed in effective presentation design. If you doubt this, attend any education conference yourself and look closely at the presentations given by university faculty. You'll find presentations for which the visual aids are simply transparencies of the handouts; the projected material is scarcely legible to the presenter, let alone the audience. Ever since college and university faculty adopted computers as presentation tools, they've by and large been content to use canned presentation templates for pure-text presentations riddled with more bullets than the St. Valentine's Day Massacre. Overly busy presentations, too, can be just as bad as bare-bones ones. Left to their own devices, students will often go out of their way to create presentations that make rich use of images, sounds, and animations. On the surface, this willingness to embrace other expressive media is wonderful; too often, however, these projects are little more than eye candy, obscuring any actual content. Unsuspecting teachers may get so caught up in the beautiful slide transitions and scrolling visual effects that they might not notice the lack of substance. I speak from experience. Fortunately, I also found a way to help students develop effective presentations without stifling their creativity. I simply informed my students that their presentations would receive two grades: one for the presentation design and one for the content. Their final grade would be the product of these two grades, rather than the sum; in other words, there were two ways to get a zero (poor content or poor presentation), but only one way to get a high grade (high levels of both). Students quickly learned the importance of having both excellent content and a well-designed presentation. Of course, this rubric only made sense if I actually taught the students effective presentation design, and I saw this as one of my duties as their instructor. After all, my focus was on the development of lifelong skills that could be used forever, regardless of changes in technology. The skills that were most often mentioned in the online job descriptions I studied were all long-life skills that I believe should be taught in our classrooms. Every one of the skills on my list can be developed within the context of any given subject. It is never too early to start developing the skills necessary for the workplace of tomorrow. When I share my observations with educators, they sometimes argue that it is not the function of schools to prepare students for the world of work. While I agree that education has other purposes, such as creating an educated populace necessary for a democracy, I am startled to hear the view that our educational system should not be used for workforce preparation. This perspective denies the function of public education as developed in the United States by Horace Mann and others, and harkens back instead to the Middle Ages, when education was provided to the children of successful merchants to “round out” their upbringing. Students in those days were from families whose wealth guaranteed them a good life whether they worked or not; those days are long gone. “But what of those students who are college-bound?” you may ask. “Certainly they will acquire the necessary work skills in college, and not at the K–12 level.” If this were true, we wouldn't have the incredible shortage of highly skilled workers that exists today. Even with the highest college graduation rate in the world, only about 25 percent of U.S. students will graduate from a four-year college, and even fewer will go on to earn advanced degrees. This means that, at minimum, 75 percent of our young people need to leave high school with the requisite skills for today's workplace. And if we just limit our attention to the highly pragmatic list of skills described in this chapter, we can see that they are likely to be as useful to college-bound students as they are to those entering the workforce directly from high school. What college-bound student would not be well-served by being technologically fluent, having good communication skills, working well in teams, demonstrating leadership skills, and being creative and a good problem solver? It seems to me that these skills serve everyone well in today's society, whether they are preparing to enter college or to start a career. Given the current emphasis on standards-based learning, teachers might well wonder how they're supposed to find the time to teach these essential skills, especially when they are not directly addressed on standardized tests. This question is tremendously important, coming as it does from the perspective of those who are still struggling inside Plato's cave. If we go back to the beginning of this chapter, we see how the good (if misguided) intentions of the Business Roundtable came into existence. 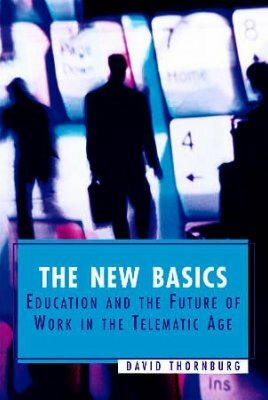 Rather than focus on the exposition and development of a new curriculum based on the needs of those who will spend their working lives in the 21st century, the Business Roundtable explored ways to improve student performance on the existing subjects using existing tests, without examining whether or not these topics and assessments were germane to the world outside of school. The power of the status quo—of the cave dweller's viewpoint—was so strong that it co-opted the efforts of those who should have known better. Our task is challenging, but not hopeless; at the end of this book we'll explore some concrete strategies for changing educational practice in support of all learners. Copyright © 2002 by Thornburg Center. All rights reserved. No part of this publication—including the drawings, graphs, illustrations, or chapters, except for brief quotations in critical reviews or articles—may be reproduced or transmitted in any form or by any means, electronic or mechanical, including photocopy, recording, or any information storage and retrieval system, without permission from ASCD.